Why Not Me? 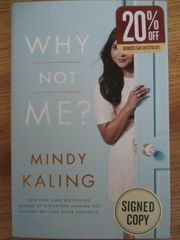 hardcover first edition book autographed on the inside cover by actress Mindy Kaling. Obtained directly from book signing, with certificate of authenticity from AutographsForSale.com. ONLY 6 LEFT.